such lovely things: A little box of loveliness. A little box of loveliness. Loveliness....after my promise of more loveliness this year, I've been a bit slack. That's not to say there hasn't been any, just that I haven't told you about it. Yet! So, today's lovely thing is this box of food. It's Wednesday, which in our house is swimming day. Both girls have lessons straight after school. Unfortunately they're not at the same time so my afternoon is spent poolside. And since the last lesson finishes so late, I need to bring their food with us. I love making these boxes. Neither girl particularly likes sandwiches so it's always a challenge to find something they'll eat and with enough variety. 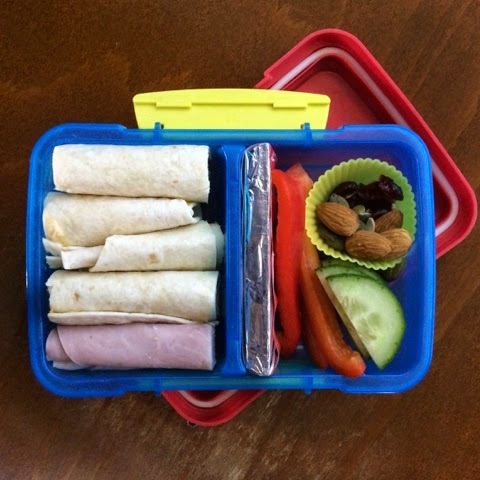 Houmous wraps (cream cheese for my littlest), slices of ham rolled up, cucumber, red pepper, a little pot of joy (almonds, sunflower & pumpkin seeds and dried cranberries) and a KitKat. Yum! I wish that was for me!